The town of Sorrento is on most Mediterranean itineraries for a reason. No other place offers so much beauty, history, and recreation as this Italian port. For cruisers, there’s a happy dilemma – what to pick for your one day in port?? For first time visitors a tour of Pompeii is a no-brainer. The eruption of Mount Vesuvius in 79 A.D buried the town in 13 – 20 feet of ash and pumice. There were occasional ‘discoveries’ of the ruins but it wasn’t until 1748 that the significance of the find was understood and excavations began. The site is a marvel in archaeology and is a UNESCO World Heritage Site. 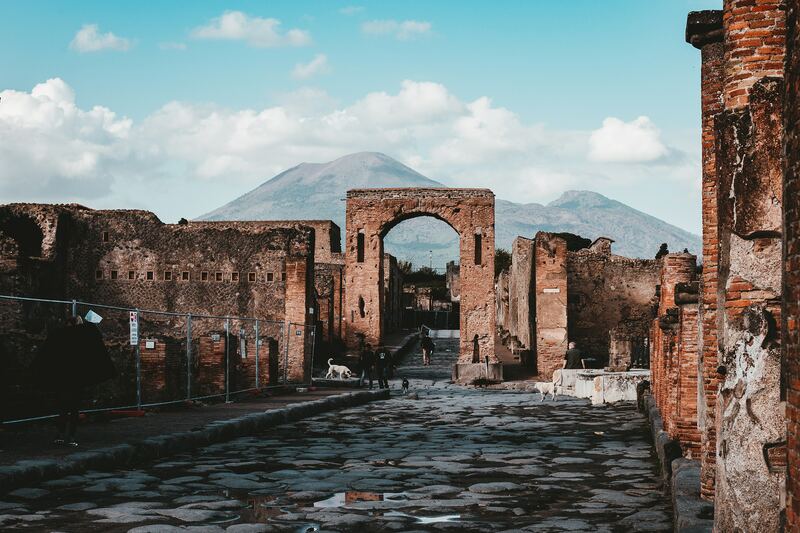 A tour of Pompeii gives you an insight into daily life in Roman times, and seeing Vesusius looming behind the ruins is a reminder of the power of nature. Herculaneum was buried in the same eruption. It was a wealthier town and the ruins reflect it. Bigger homes, more elaborate ceramics. The ruins are in better condition as the type of ash that fell on this city fell ‘softer’, burying the city but not collapsing structures as in Pompeii. I visited Pompeii as a child, and brought my children thirty years later. The extent of excavation and restoration done between these visits was impressive. Most of the excursions to Pompeii or Herculaneum get you back to Sorrento with a bit of time for a glass of wine or a quick shop. Take advantage of this! If you travel to Pompeii, make sure to bring a hat, water, and sunscreen. There is little shade and the sun is intense. Be prepared for 2-3 hours of walking on uneven surfaces. The isle of Capri is a gem in the Tyrrhenian. It is accessible by a fast ferry that leaves Sorrento every half hour and takes 25 minutes to reach Capri. Taking a Capri shore excursion organized by your cruise ship makes the logistics easy. On our Recent Windstar cruise, the ship did not offer an excursion, but, as this was a special day (Mr. Traveling Tull’s birthday), we decided to take the chance and book a private boat tour in Capri. Taking a private tour can be risky, since the ship has no obligation to wait for you before casting off for the next port of call. Fortunately our Windstar tour manager got us on the first tender off our ship so we’d have plenty of time to make the early ferry. Once on Capri, we met our contact from Gianni’s Boats and shown to a small “gozzo” boat with a wide cushioned deck. We took off our shoes, sat back and enjoyed three perfect hours on the water. There is no better way to see the island than by boat. Our charming captain, Vittorio, took us into one gorgeous grotto after another. The sun was brilliant, the water astounding shades of blues and greens, and the white cliffs dramatic as they rose above us from the sea. Vittorio stopped in a quiet cove to give us the opportunity to swim. The water was brisk but we weren’t going to miss a chance to swim in the clear blue water. Back on board, the captain surprised Dave with a homemade cake and a bottle of prosecco. Couldn’t have been a more perfect celebration! We returned to the dock in Capri, had lunch, and still had time to take the funicular up to town. The village of Capri is stunning, with high-end shops and boutiques. We browsed but didn’t buy, instead choosing to walk through the narrow lanes to the other side of the island. Here we visited the Garden of Augustus, a delightful spot with lush greenery and the best view on the island. The best part of our day was getting back to the ship in time!! If you decide to go to Capri on your own, check the ferry schedule carefully, remembering to allow for time to tender back to your ship. A stunning drive along the Amalfi Coast (a UNESCO site) takes you to Positano, a picture-postcard town. The town rises from the pebbly beach to the cliffside with steep narrow streets. A fabulous spot for shopping, people watching, or a great seafood meal. This is a very popular spot for tourists and can get crowded. The drive along the coast can be a bit scary for those with a fear of heights. Last, but certainly not least, the town of Sorrento is a destination in itself! The town is lively with lots of great restaurants and shops. You can tour a cameo factory (exiting through the gift shop, obviously) or just find a shady spot for some truly authentic pizza. An afternoon spent in Sorrento is one of our favorite memories from our trip with extended family in 1994. Whatever you choose, you will have a fabulous time in this incredible port. With luck, you’ll return to the Amalfi Coast, perhaps staying on shore in one of these picturesque spots. 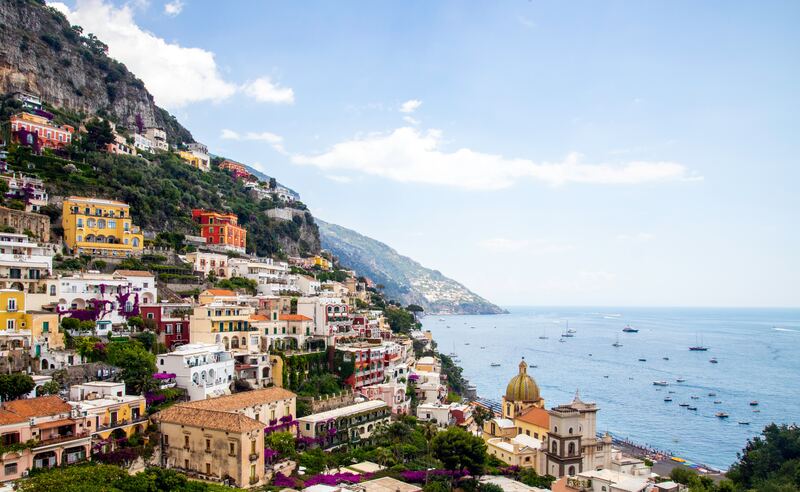 Have you stayed in Positano or Capri? What kind of accommodation would you recommend? Your in-depth guide to the very best of Naples and the Amalfi Coast. Make the most of your trip to Naples and the Amalfi Coast with our DK Eyewitness Travel Guide. We love the Top 10 version of the above book. Travel-friendly sized, with easy-to-use “top 10” lists that help you plan the vacation that’s right for you. SHORT STORIES Day of Fire by E. Knight, Stephanie Dray, Ben Kane, et. al. With his trademark elegance and intelligence, Robert Harris, re-creates a world on the brink of disaster. Posted on March 28, 2019 April 2, 2019 by TravelingTullsPosted in cruising, Europe, Italy, Journey Mediterranean Cruise, UNESCO world heritageTagged Amalfi Coast, archaeology, blue grotto, Capri, Italy travel, Pompeii, Positano, private tour, shore excursion, Sorrento, Tyrrhenian Sea, Windstar Cruises.